It’s time for another Siteturner roundup! This time we’re taking a look at a few of the best and fastest corporate WordPress themes (that are mobile-ready and SEO optimized). If you’re a developer looking for a theme for a client, or a designer looking for inspiration, hopefully you’ll see something you like. There’s no must-have features for a corporate theme, and the functionality required will vary on a case to case basis. But there is a corporate web design aesthetic, and that’s what we had in mind when selecting themes for this roundup. Clean, modern and almost minimalistic design is favored by corporations and businesses. Businesses want their service, product or message to take center stage, not gimmicks, animations and unnecessary distractions. Plenty of white space and typography that ensures high-readability is key to a successful corporate design. If you don’t find what you’re looking for on this list, we recommend checking out our other roundups of business themes and business directory themes. Or you might even find something you like in our collection of insurance agency themes. Striped was designed especially for corporate, business, consulting and finance firms. It’s a large, multipurpose business theme with a variety of industry-tailored presets and layouts to choose from. (Which can be easily installed using the demo content.) It bundles Visual Composer and Rev Slider free, supports WooCommerce and Events Calendar, and provides plenty of options for code-free customization. Striped is SEO-optimized, to help you secure a top spot in Google, fast, and mobile-ready. This SEO-ready corporate theme was built on top of the robust and responsive Twitter Bootstrap 3 framework. 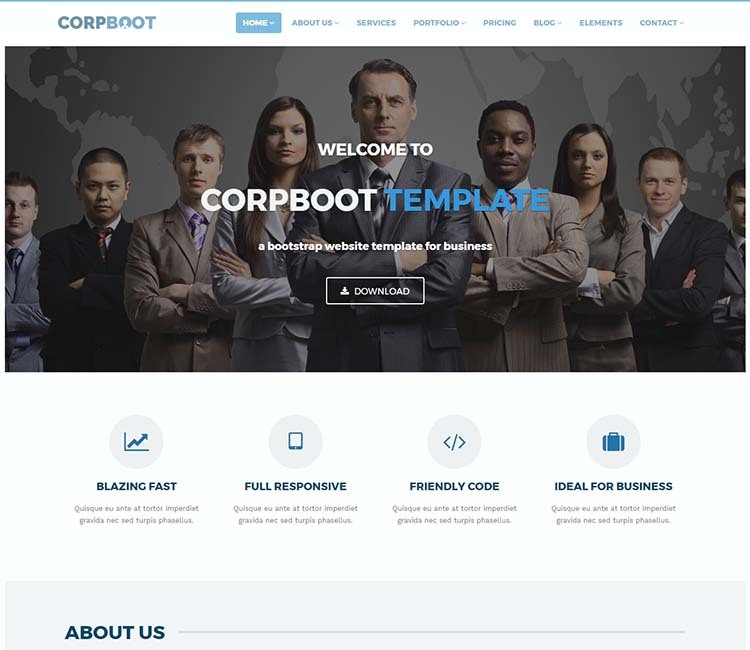 Optimized for mobile devices, Corpboot supports (and includes free) Visual Composer for creating and editing layouts. Mailchimp is integrated to help you build your newsletter mailing list, and Contact Form 7 is supported for building web forms. It’s a breeze to install and configure, and includes plenty of documentation to help you along. The development team provides fast, friendly support. 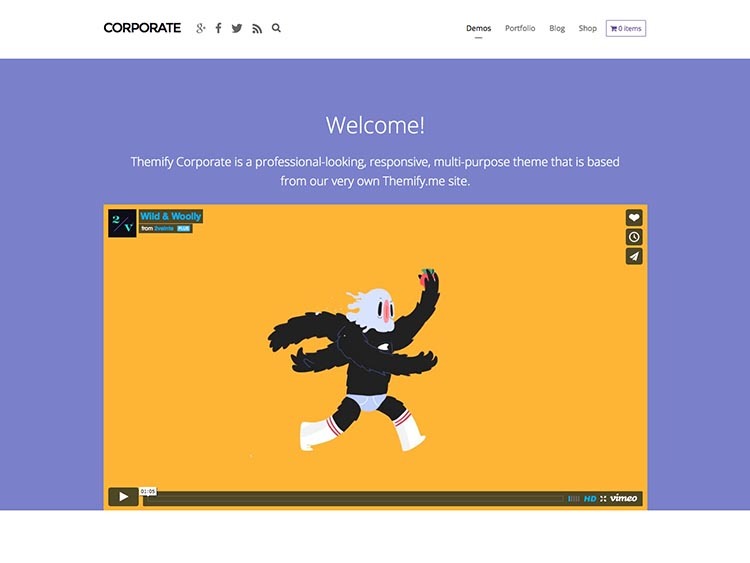 Themify is one of the best active WordPress developers, and their simply titled Corporate theme has appeared in other Siteturner roundups. The beautiful, contemporary, flat design of Corporate isn’t even the best thing it has going for it: Themify’s Builder framework is one of the best WordPress frameworks available, and it lets you created unlimited layouts with ease. Corporate is fully responsive, SEO-optimized and translation ready. SEO WP was specifically designed for marketing agencies and SEO specialists, but will lend itself equally well to corporate websites. 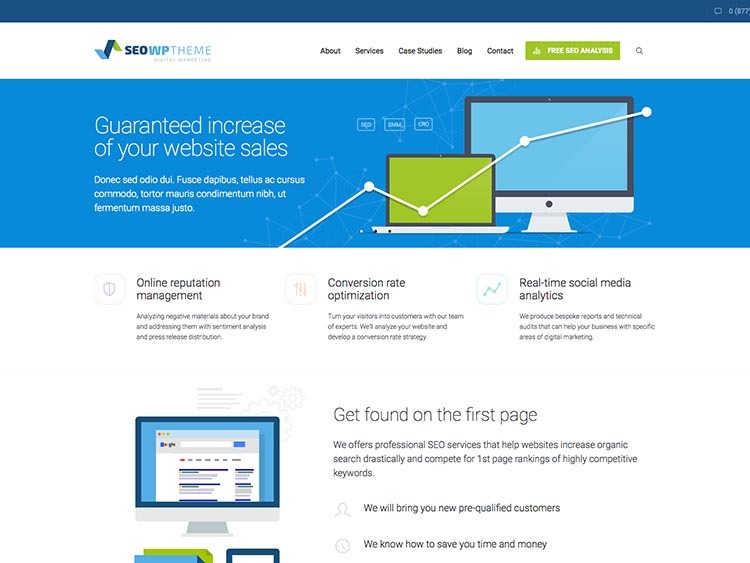 SEO WP is a flexible theme with a ton of options and layouts at your disposal. A premium, drag & drop page builder called Live Composer is bundled free. 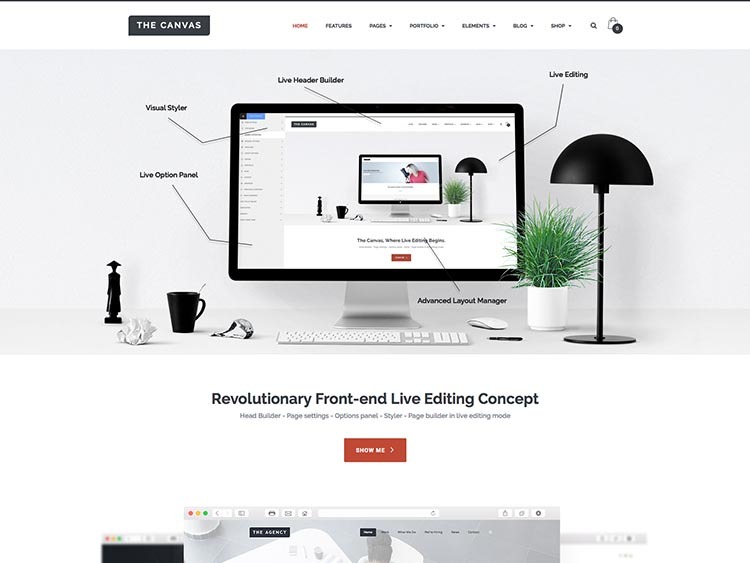 The Canvas is a featured-packed, multipurpose WordPress theme that works great for establishing a corporate web presence. The strength of The Canvas is found in its versatility, and the live front & back-end page builder represents the future of WordPress. The Canvas includes LayerSlider and Revolution Slider free. It’s optimized for WooCommerce, SEO, the Event Manager plugin and it supports both Contact Form 7 and Gravity Forms. 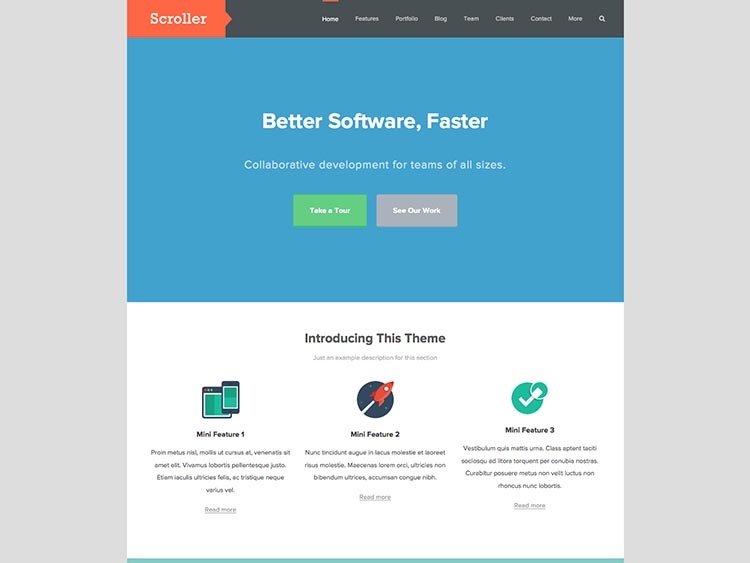 Scroller is a no-nonsense, fast & responsive flat theme intended for building business and corporate websites. It’s easy to use, search engine optimized and even includes an ad management system for more monetization opportunity. Its fast, one-page functionality is an excellent example of top-notch UX. Easy to use and 100% responsive. The Marine theme looks a bit too industry specific at first glace, but a closer look reveals an unusually gorgeous product that takes the best qualities of modern design trends and combines them into something special. This is multipurpose theme that provides 9 different skins out of the box, but the business layouts and SEO agency layouts are of particular interest to those building corporate websites on WordPress. 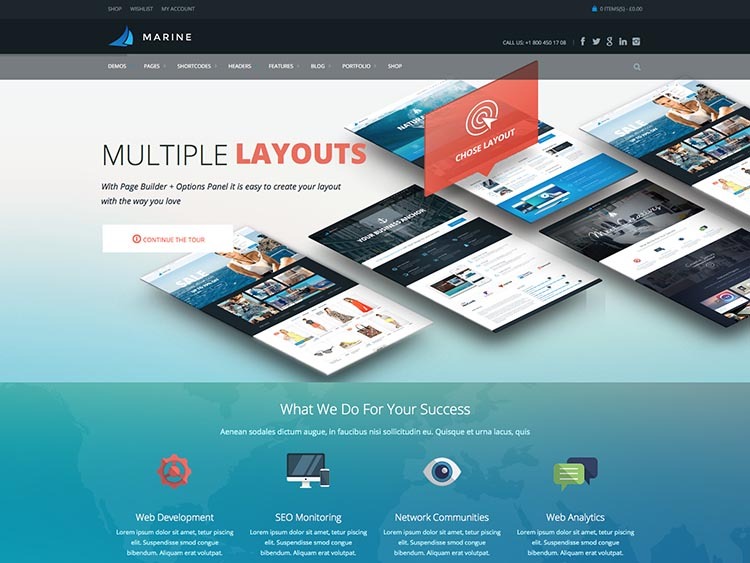 Marine is both responsive and retina-ready, ensuring awesome performance and experience across all mobile devices. It’s SEO optimized, WooCommerce ready and endlessly customizable. 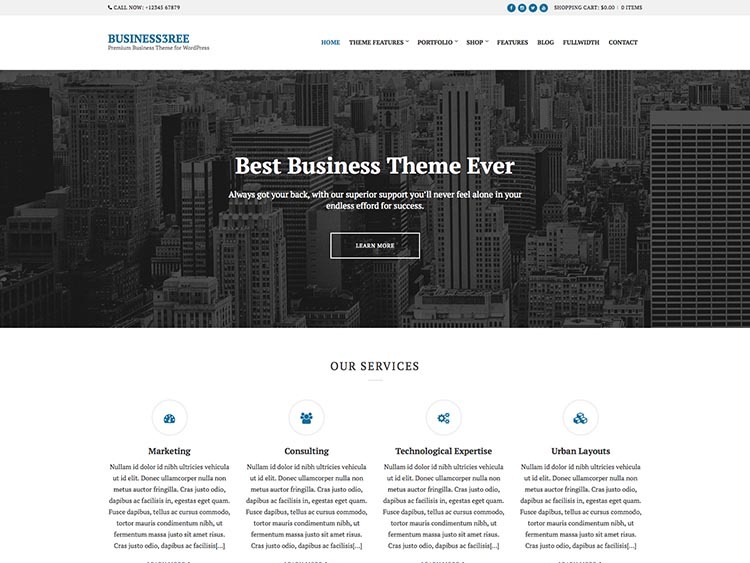 Business3ree is the third (and, in our opinion, best) corporate WordPress theme from the team at cssigniter. This clean, fast theme embraces classic corporate web design trends and provides everything you need to build a website for your business. It’s extremely easy to use, for both visitors and site owners, and drag & drop homepage building is supported. We’d be interested to know the story behind the name – Blame is a unusual name for a theme – but you forget all about that once you see the theme close-up. This ultra-responsive, gorgeous WordPress theme comes with six skins, support for video backgrounds, and parallax backgrounds. Visual Composer is included for drag & drop functionality, and LayerSlider & Rev Slider are bunded free. The code is clean, semantic, and SEO-optimized. 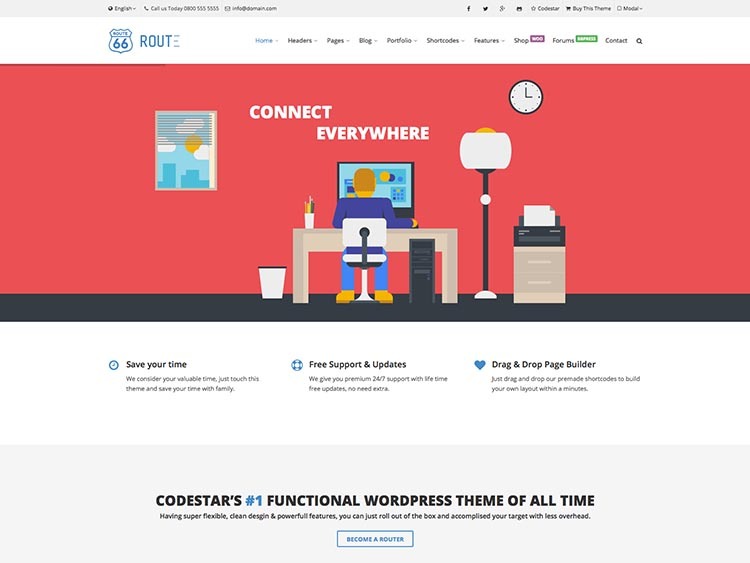 We expect Route will be exactly what many of our readers are looking for, and it works great as a corporate WordPress theme. The developers have fully embraced modern design trends and functionality, and the theme supports a number of third-party plugins, like WooCommerce, bbPress, Gravity Forms and more. 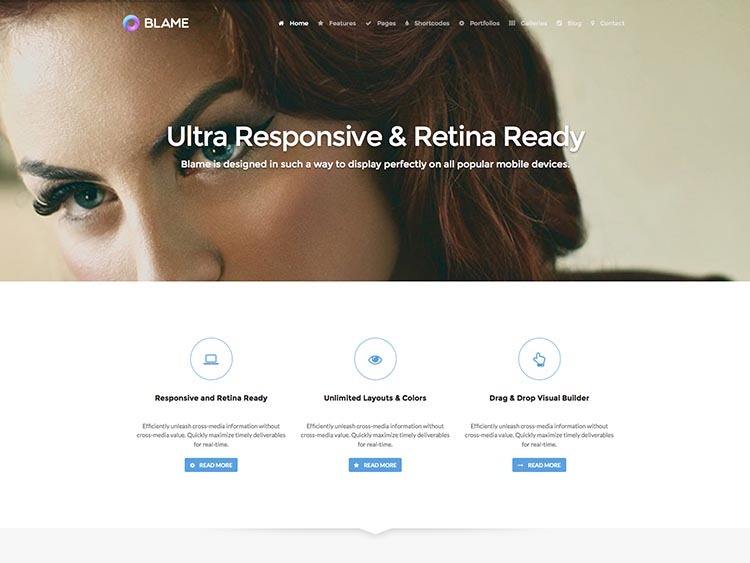 Route is retina-ready and responsive, and includes VisualComposer, Slider Revolution, LayerSlider, and GoPricing. 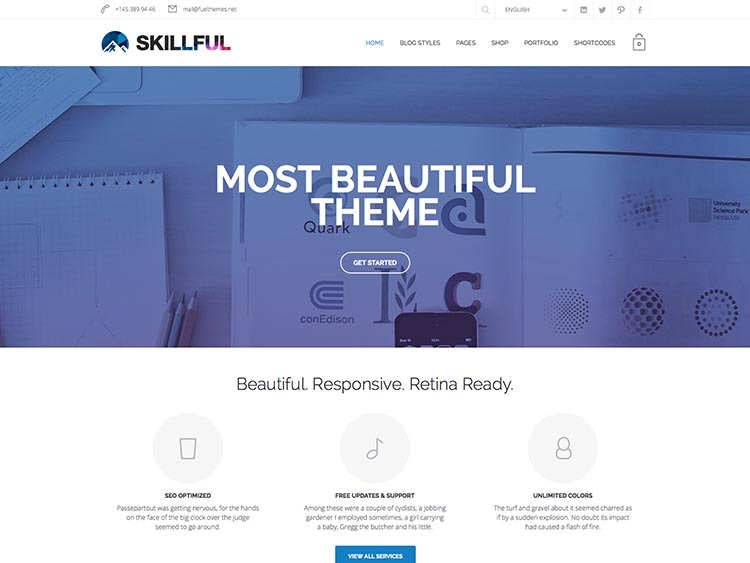 Skillful is a multipurpose, responsive WordPress theme that has a lot in common with Route, above. The theme us SEO optimized, RTL ready and WPML ready. SCSS files are also included for developers that use CSS preprocessing. 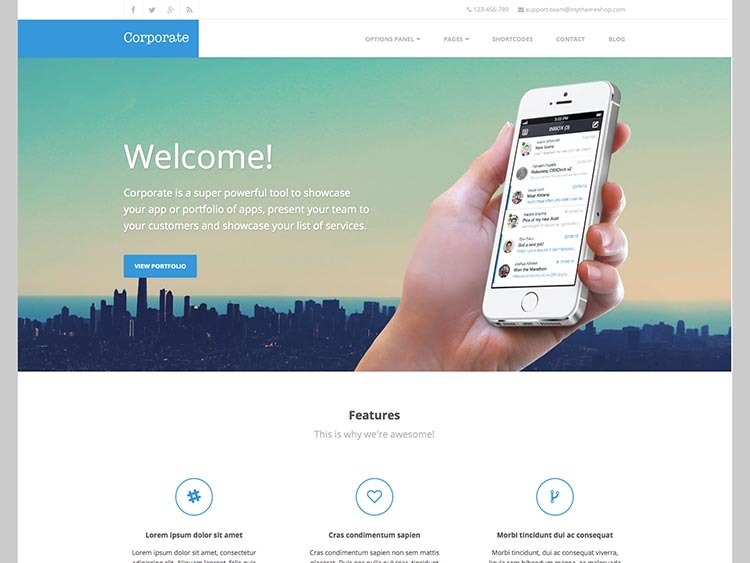 Made specifically for businesses, agencies, and corporations, the Corporate theme (not to be confused with Themify’s Corporate theme) is not only optimized for search engines, mobile-ready and speed optimized, but also includes a lot of great features like parallax backgrounds, a porfolio and social media integration. If you already have a design for your blog or website, and you want to convert it to WordPress, this is the way to go. For only $25, you can hire a top rated WordPress dev on Fiverr to convert your Photoshop PSD design to HTML and WordPress. This is a great option if you previously had a blog or website on another platform and want to move to WordPress. If you want something custom but don’t have a PSD design, you can get a custom WordPress theme created on Fiverr for $50. You’ll get more of a bare-bones design than one of the themes above, but this is a great option if you’re looking for something with a certain layout or color scheme. 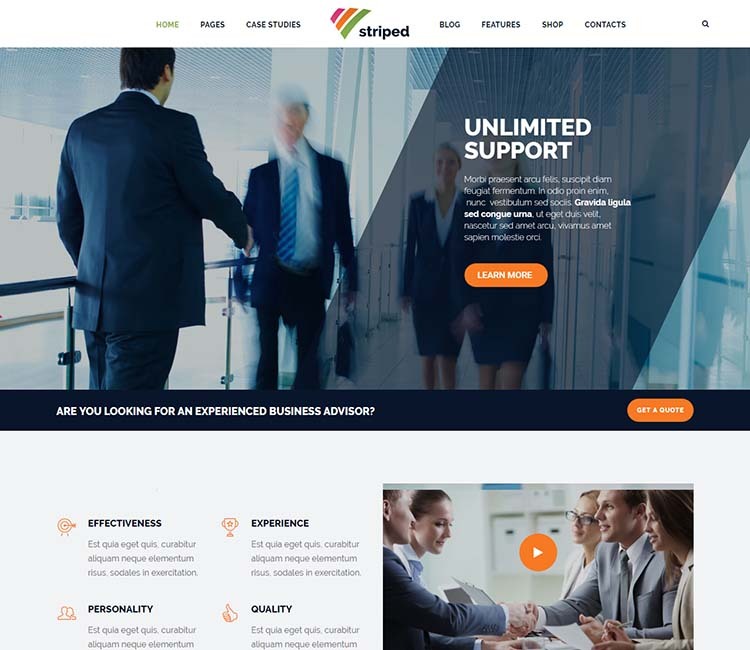 And that wraps up our collection of some of the best, fastest, mobile-ready and SEO optimized corporate WordPress themes. If you’ve got any suggestions, let us know in the comments. good list of wp themes.. but what about the speed? its fast enough when loading? It’s a nice and useful post. Thanks for sharing. In today’s era, users want to get an all in one theme for their websites, so now, it becomes mandatory for designers and developers to design an SEO & Mobile friendly themes for the users. That’s the reason I’m using a template – toaster for creating SEO & Mobile themes. How did you determine these Themes were fast? Great sources, thank you !! !